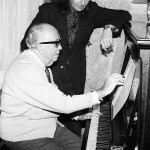 Jack was a huge celebrity, popular in his day as a composer, performer, recording artist and radio personality. 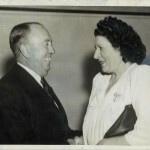 In his role as professional song plugger with Allan’s Music Publishing, Jack was expected to schmooze visiting and local theatrical managers and performers to get them across the line and singing Allan’s songs. Well-known stars were wined and dined at home parties or Melbourne’s hot spots and many visited him over the years. He loved a party and the press loved him. 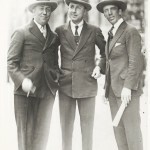 Credit: Jack O’Hagan (left) with vocalist/composer Jack Lumsdaine (centre) and performer Dan Morris (right) in Collins Street, Melbourne, 1928. Jack O'Hagan Collection, State Library of Victoria. 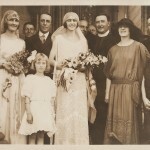 Credit: Jack and Josephine O’Hagan’s wedding at St Peter & Paul’s Church, South Melbourne, 1924. Jack O'Hagan Collection, State Library of Victoria. Credit: Jack O’Hagan parties with great friend, famous singer Gladys Moncrieff, known as 'Australia's Queen of Song' and 'Our Glad', c.1930. Credit: Jack and Josie O’Hagan’s 17th wedding anniversary. 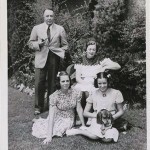 Left to right: Jack, Pamela, Josie and Jeannine O’Hagan with ‘Chips’. Published by The Listener In, 1941.
Credit: The Man Who Made Gundagai. 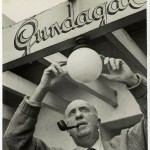 Jack O’Hagan at his home ‘Gundagai’, Harwood Street, Elwood. Published in Woman, 1950. Jack O'Hagan Collection, State Library of Victoria. Credit: Jack O’Hagan and Barry Humphries, 1971, News Ltd / Newspix. 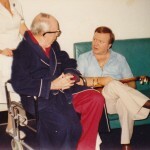 Bert Newton visits Jack O’Hagan at Florence Nightingale Hospital, Brighton, 1980 (family photo). Barry Humphries, Comic Controls Cabaret, Upfront, Qantas, June 2015.